One good thing that this lousy economy has brought me is shortened work hours. Well, good in the sense that most days this summer I’ve been able to leave the office about four and get home in time to putter in the garden or laze around on the deck before the sun went down. Our house faces east toward the water. We get the sunrise and early sun. But a forest of lovely tall evergreens stands between us and the evening sun. So by 6 or 7 we’re in the shade while west side residents are baking and squinting. On many occasions I prolong the day by rowing out to the boat to drink a Mike’s and write, sketch or take pictures. Now that the days are waning and the sun setting farther south, it’s a bit harder to get that summertime feeling each afternoon. So now I have to make sure I get down to the water and climb in a kayak for at least a short paddle to prolong the sense of vacation. It’s way too easy to just jump into the next project (or in these lean times, the second job) and forget to take advantage of the good things this place affords us. Friday I went to Skagit Valley for a green building class on the latest HVAC innovations. At four we were still sitting there listening to five heating company reps argue about which is best, forced air, radiant in floor, radiant ceiling panel, heat pump or solar hot water. I got a little antsy that I’d missed my daily dose of lazy moment in the sun. 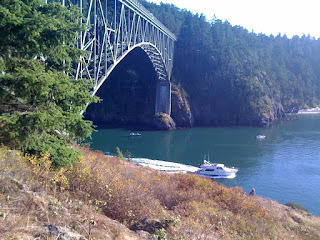 To cut my losses, on the way home I pulled out of the line of motorhomes seeking one last weekend in the wilderness and stopped at Deception Pass. The trails under the bridge are always steep, rocky, dotted with pockets of loose scree and generally not for the faint of heart. Being as I was wearing sandals with heels rather than hiking shoes I didn’t get far from the road, but I did find a little grassy spot atop a rock outcropping and settled in to watch the water. Boy was that place busy. Much like the motorhome travelers, the power boaters were out in force. They’d made a beeline for the marina after work, slipped that puppy in the water and were heading out. Everybody needs their fix and each Friday we all think “this might be our last good weekend,” so there’s a frenzy of relaxation and leisure going on.